← Are you ready for a new Feyland adventure? Grab this anthology! Storms of Fate and Fury is a unique multi-genre anthology that brings together the best of epic fantasy, fairy tales, mythology, and more. Let the winds of magic, legends, and shadows sweep you away to worlds where impossible quests clash with forbidden love. Destiny can be a dark gift when the fate of all that you love rests on a sword’s edge and every choice is marked by sorrow or sacrifice. 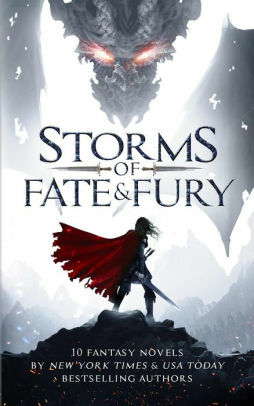 From gods and their games to the games that make gods, Storms of Fate and Fury promises and non-stop delivers with thrilling adventure and deeply lush romance. This critically curated anthology from award-winning New York Times and USA Today bestselling authors uses cutting-edge augmented reality to bring stories vividly to life. Explore artwork, maps, and exclusive bonus content that keep the magic alive long after the tale is told. This entry was posted in Book Bundles, Books, Science fantasy. Bookmark the permalink.